British modular housebuilder ilke Homes has officially opened the doors to its first modular housing factory in Knaresborough, Yorkshire. ilke Homes aims to build 2,000 new homes a year within the next 24 months, and plans are already in place to scale up the operations to produce 5,000 homes per year in the next five years. The state-of-the-art factory uses innovative, modern methods of construction to build eight modular homes every day and specialises in the latest off-site manufacturing techniques. The high-quality, energy-efficient homes are transported to developments across the country and once on site, can be installed at a rate of six homes per day – significantly cutting the time a traditional build programme takes to deliver family housing to those who need it most. The opening of the factory has created more than 250 local jobs across ilke Homes’ manufacturing and supply chain, design, engineering and business teams. The housebuilder plans to expand its Yorkshire workforce with a further 500 high-quality jobs becoming available over the next five years. Björn Conway, CEO of ilke Homes said: “We’re proud to officially open our first modular house building factory in the UK; using modern methods of construction and new technologies to deliver beautifully designed, sustainable family homes across the country. RT Hon James Brokenshire, Communities Secretary added: “I am determined to build a housing market that works for everyone. Innovation in house building is a key part of scaling up delivery, which is why I am keen to support increased modular build. 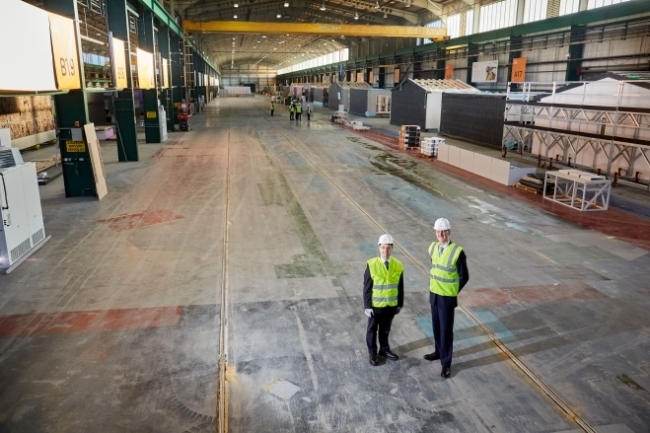 “ilke Home’s new factory will play an important role in the delivery of high-quality affordable homes both here in Yorkshire and across the country. “The site will support the local economy and provide local jobs while driving innovation and modern methods of construction to produce around 2,000 homes a year and help us deliver the homes communities need. The attractive range of house types is designed to perfectly serve the needs of modern living and includes homes for open market sale, as well as homes for affordable and private rent. Homes will have flexible layouts with over 100 possible variations, from two-storey terraced houses to three-storey semi-detached properties, and blocks of flats of up to four storeys.